There is a lot to be said for painting on location, especially when there is an abundance of magnificent subject matter. Wonderful views can be breath taking but even more importantly one should seek out the subjects that excite YOUR passion. 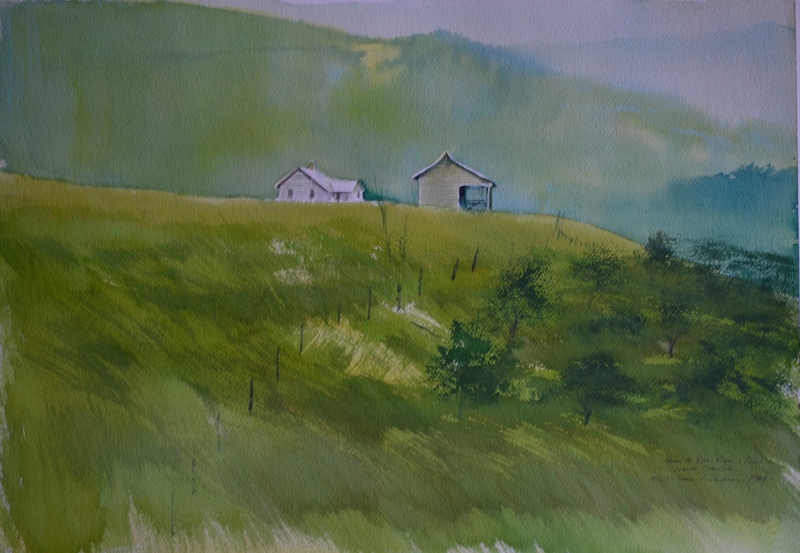 In this series I will be exhibiting on-site watercolors that were done in the Blue Ridge Parkway area in North Carolina. This piece was done fairly quickly and has a spontaneous feeling to it. It was accomplished in under an hour, more like about 40 minutes. While there was no rush, the sunlight and the breeze speeded up the drying time. The palette was simple. I used thalo blue for the sky, Indian yellow and thalo blue for the green and a hint of violet for the distant mountain and the house. The stand of pine trees was added after the paper was dry. The initial wash for the sky was applied over a wet surface, taking care to avoid wetting the house. With a bit of practice you can paint right up to the edge of an area with a great deal of precision. The trick is that the watercolor wash will migrate freely over the dampened area but with care it will not venture onto the dried sheet. When I use the word care I mean to say it is best to allow the wash to migrate on its own. If you have too much water it may be difficult to keep it from wandering into a dry portion of the paper. With a little practice you can take advantage of the dampened sheet without diluting the color too much. I prefer to travel light leaving non-essentials at home. What is essential? Water, watercolor paper, pencils, brushes and paint. For paper I prefer to use a 140lb. coldpress watercolor block because it is convenient. In the studio I often staple my paper to a 5/8″ thick sheet of plywood. I have several that I have sealed with varnish and have been using them for years. Today a lot of my students choose Gator board. Since I still have good plywood boards I see no reason to change. However, this is a matter of preference. In the field the block lightens my load and allows me to work without having to worry about buckled paper. I always find a log , rock or some other support to rest the block without an easel. I have a beautiful French easel but it is added weight. I started out using one outside but found the weight was a restriction in many of the places I was visiting. Try rappeling down the face of a cliff with a lot of added weight or jumping from rock to rock to get to the right vantage point. I do use an Army surplus ammunition can for my water storage and for a painting bucket. Yes, it is heavy but a good tight, no leak, water source is vital. That is why I suggest that you consider what you REALLY need and what you can do without. I’m old school. When I paint on-site, I sketch and paint on-site. At times I will take photographs for later reference but my primary focus is the subject I am painting. This is why I believe PASSION is vital. If you are not aching to paint it, why bother? I don’t use Photoshop or other manipulations on photos. To each his own but I prefer to get caught up in a dialogue with the object that has sparked my desire. Later in the studio if I desire to delve deeper I will drag out the photos, if I have any, to take me back to the moment. I like to use photos like a sort of time machine. I hear the sounds, smell the smells and am transported back to the spot. Mountain Pasture, Blue Ridge. 20″ x 14″ , 140lb. cold press watercolor paper. Another simple on-site attempt. The palette is very limited. Indian Yellow, Thalo blue and Winsor Red. I quickly drew in a simple horizon line and roughly positioned the buildings before dampening the sky down to the horizon line taking care to avoid getting any water on the buildings. I took a moment to carefully introduce water around each of the building shapes. This is a critical moment, so be careful. A pale wash of dilute Thalo blue was washed into the sky and allowed to descend to the horizon line. While the paper was barely damp I put in another wash of pale blue with a touch of Indian Yellow to create the distant mountain range. If you consider the edge you can see that some dry areas produced a crisp edge while a couple of damp spots blurred, creating a hazy effect. A careful examination of the horizon line will reveal a very thin white line. While the sky and distant range was drying completely I took my large 3″ brush and dampened the foreground. I was VERY careful to keep the area above the horizon line from bleeding into the damp foreground. While this is not quite like brain surgery you do want to be careful to keep the two damp areas from intermingling. That way you can prevent an uncontrolled bleed between the two areas from occurring. 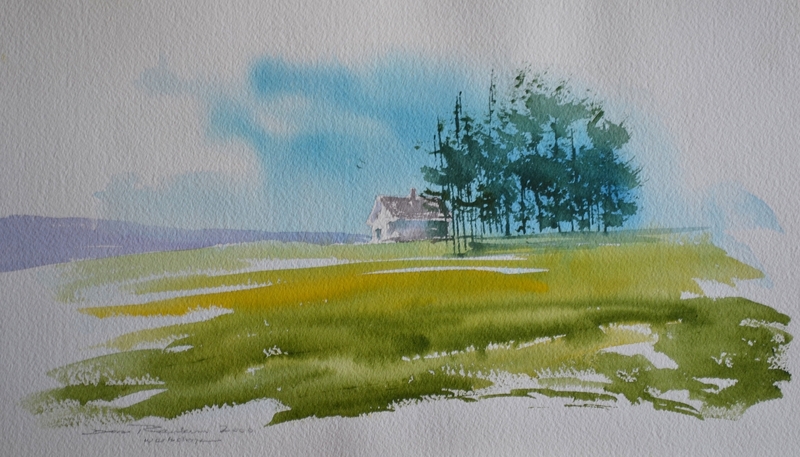 While the foreground was damp I brushed in a wash of Indian Yellow. I brushed it in a varying degrees of intensity but it was not a totally flat tone wash. When the yellow was completely dry; a second wash of Thalo blue was washed over the area. After ti was dry a mixture of Thalo blue, Indian Yellow and Winsor Red was applied using a large 3″ flat brush. Some areas were dry brushed. Once the major tone was set I began to develop the barns with dry brush strokes, using a mixture of Thalo Blue and Winsor Red. The white of the paper was allowed to shine through in critical areas to denote highlights. The darker detail lines, doors, etc. are merely stronger mixtures of Thalo Blue and Winsor Red. You will find it to be a very versatile mix. It can range from pale weathered grey to deep optical black. The cedar tree is dry brush Thalo Blue ans Winsor red as well. North on the Blue Ridge Trail, 20″ x 14″ 140 lb. cold press watercolor paper. A beautiful vista. I think the thing that really captured my attention was the sense of freedom. It was almost like one could just fly off toward the horizon. The wind was blowing gently with an occasional gust moving the grasses around in circular patterns. The distant haze of the mountains added to the power of the view. The palette is identical to the last painting, only the proportions are changed. As you look you can see that almost the entire sheet was flooded with varying degrees of Indian Yellow. 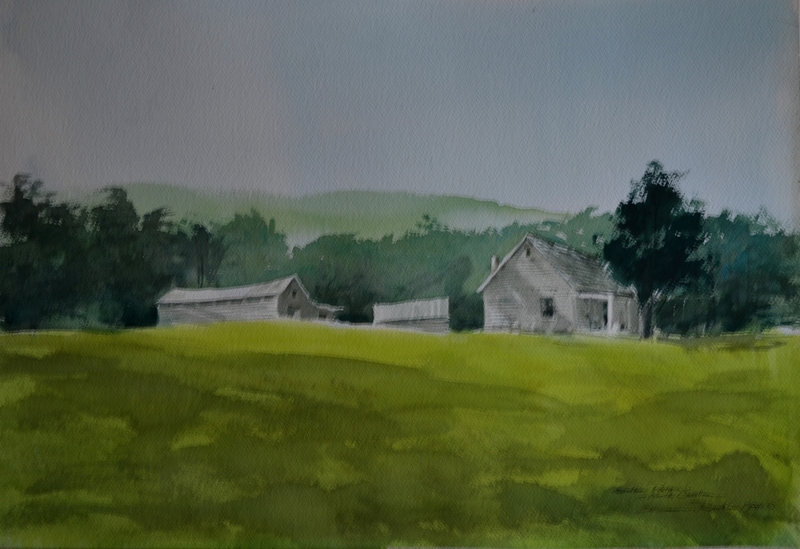 Once again the basic shape of the house and barn were avoided with the initial water wash. The entire sheet , except for the two buildings, was dampened. The yellow was not introduced into the sky. Look closely and you can see the effect. Due to the weather, the wash dried rapidly. After it was dry another clear water wash was applied down to the horizon line. Once again the buildings were avoided and left dry. A wash of Thalo blue was applied creating a misty effect. As the paper neared drying the darker portion of blue mountain on the right was put in. A very pale wash of Indian Yellow was washed over the entire foreground that had just been dampened with clear water. Once the area was dry a pale wash of Thalo Blue was flooded over the same area creating a delicate green. As the large expanse began to dry I washed in a dry brush mode several washes of Thalo Blue, a bit of Indian Yellow and Winsor Red to create the shadow areas. The darker trees are Thalo Blue. The language of the brush and a painting that was started outdoors and finished in the studio.